Today my good friend dropped off a meaningful Christmas gift. This shows how organized and thoughtful my friend is since it is only December 7. It was really positive motivation to get prepared for the Christmas season ahead. Giving should be stress-free, so I have created a gift planner and some gift tags to help you focus on the good feelings and less rush and chaos. The things I believe will eliminate stress this season is preparing and planning for who you want to give gifts to, what you want to get or make, how much money you can spend on the gifts and why the money and or effort is worth using for another person or for a tradition. How Does Your Family Do Gift Giving? For years now I have been drawn to simple gift giving. One idea is giving your children and family members four gifts this Christmas: Need, Want, Wear/Clothes and Read/Education. This really helps me as I am shopping to keep my spending in check and to really consider the value of what I am buying. Also, I recently heard about a family who follow the example set by the wise men who gave Jesus three precious gifts. This family connects gift giving with the Christmas story and their children understand the three gifts they receive in a special way. As you can tell by the suggestions I give, I believe that simple and meaningful is better than excessive and devoid. Have your children buy gifts for other children in need. Include them in the shopping wrapping and delivering. Have your children buy each other one gift each and help them be creative and thoughtful about the gift. The less gifts a person gets, the more you will think about what they would really like. Secret Santa: pick a family and deliver gifts to their door the twelve nights before Christmas without letting them know who it is. This was a favorite of mine growing up. This Christmas I want to be more thoughtful about gift giving and traditions. I certainly want to create memories that bring me and my family joy and peace. 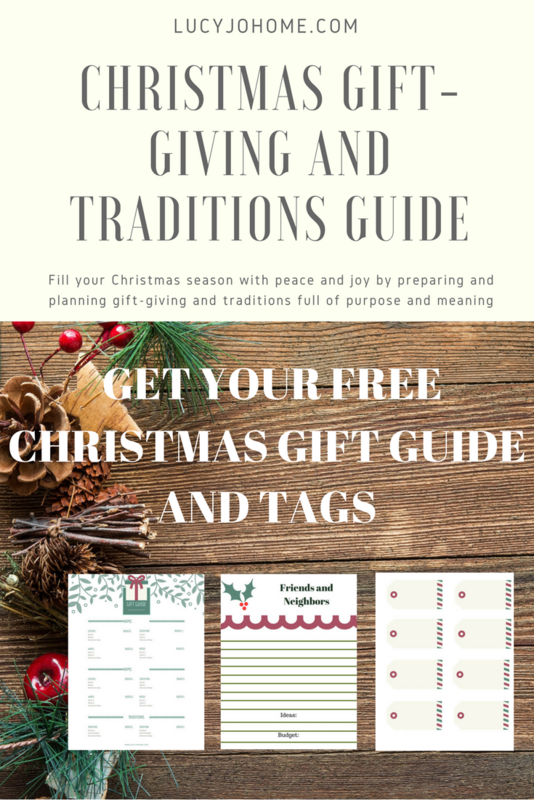 I hope that these simple Christmas gift and tradition planners and gift tags will help you feel more of the Christmas spirit that warms you from the inside out. I am off to get organized! Sending Christmas cheer your way! P.S. Stay Tuned: Next week I will be sharing ideas for Christmas experiences that could replace traditional gifts.